This classic Christmas cake is covered in home-made royal icing and marzipan then adorned with edible snowflakes, it’s perfect for wowing guests. Make the Drambuie and orange Christmas cake. To make the marzipan, put the ground almonds in a bowl with the caster sugar and icing sugar. In a small bowl, whisk the egg, vanilla extract, almond essence (if using), brandy and lemon juice. Make a well in the centre of the sugary ground almonds and add the liquid, then mix with your hands to bring together into a paste. Knead for a few minutes until smooth, then wrap in cling film and chill for 20 minutes or until needed. Mix the apricot jam with a little boiling water, then use a pastry brush to coat the whole of the cake with the jam. On a surface dusted with icing sugar, roll out the marzipan into a large circle (about 45cm in diameter). Use the rolling pin to help you lift the marzipan and carefully place it over the cake, making sure the centre of the marzipan circle is positioned on the centre of the Christmas cake. With your hands, carefully smooth the marzipan over the cake and trim any excess from around the base with a sharp knife. Leave the cake in a cool dry place for a day or two to dry out before icing. Make the royal icing. Put the egg whites in a bowl and add the icing sugar bit by bit, stirring until you get a thick dropping consistency. Use a whisk to beat the mixture until it starts to form peaks, then stir in the glycerine. If you like, stir in a tiny drop of blue food colouring. Smooth the icing all over the cake with a palette knife. Once it’s covered, wet the cleaned knife in a jug of hot water and use it to give the icing a smooth surface. Stick edible snowball decorations around the base. 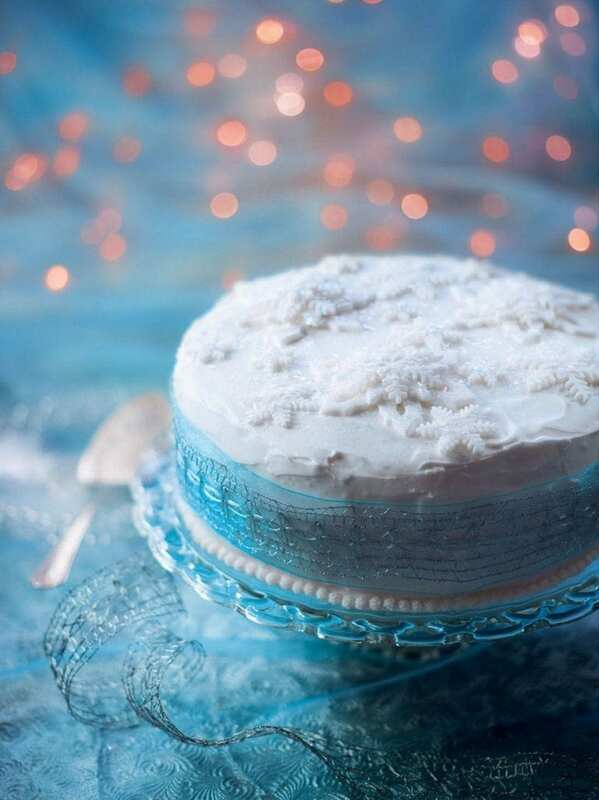 Leave the icing to dry overnight before attempting to decorate it. To decorate the iced cake, roll out fondant icing on an icing sugar-dusted surface and use snowflake cutters to cut different sizes and shapes of snowflakes (you can cut out or indent small snowflakes inside the larger ones, too). Moisten the back of each with water and gently stick to the cake. Dust the cake with edible lustre or glitter and finish with cake ribbon. Icing cutters, ribbon, edible snowballs, lustre dust and glitter are available from cake-decorating shops or online stores such as cakecraftshop.co.uk. Please note that this recipe contains raw egg.